PreSonus introduces ULT, a new series of active loudspeakers with three models including a subwoofer. Grund Audio announces the addition of powered versions of its ACX loudspeakers. Discover the new P1000X powered loudspeaker at the Gibson/Cerwin Vega booth at Summer NAMM 2014. Cerwin Vega adds to its P Series the P1000X 10” powered speaker, which is showcased this weekend at Summer NAMM 2014. 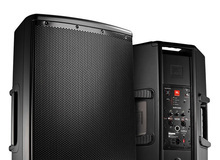 Mackie introduces the 2014 edition of its Thump series of powered loudspeakers, which power now reaches 1000W. PreSonus announces the availability for the SL Room Control remote control software for the StudioLive AI powered speakers. RCF introduces a new full range amplified loudspeaker for medium and larger venues, the ART 745-A. Mackie introduced at Musikmesse 2014 the new generation of the SRM 350 and 450 amplified portable loudspeakers.